The water collisions in this video was shot using the 120fps windowed mode in the URSA Mini 4.6 then slowed down to 50% in Adobe Premiere with optical flow. The shutter angle was a very narrow 11.2 degrees to freeze each frame of fast moving water. The water glass reveal a the end was shot with the camera on it's side to capture as much detail in the splash and glass as possible within the 2k windowed frame. Donnell Henry wrote: Wow Benton love it. "Since the first free elections were held in April 1994, South Africans are popularly known as the ''rainbow people''". Does the USA need to find it's purple? Leon Benzakein wrote: "Since the first free elections were held in April 1994, South Africans are popularly known as the ''rainbow people''". Thanks for your interesting link and comments Leon! I’m glad you found it provocative. I did indeed design it to make people think. The symbolism of purple in this context does not necessarily mean compromise, but rather a higher state of awareness and level of consciousness on all sides. This results in true enlightenment and understanding. And yes, the USA desperately needs to find its “purple”. Fabulous and spectacular photography and composition. Great finds for the music and animation, too. OwenCrowley wrote: Fabulous and spectacular photography and composition. Great finds for the music and animation, too. Thanks for the complement Owen! Yes, I was very fortunate to find the music that I did. It took a while to find just the right tone and pace for the main piano track and finding the trumpet and strings that worked seamlessly with the piano was near magic. When I first laid the trumpet over the piano track, I couldn't believe that the trumpet wasn't written for that music at all, but it fit so beautifully! The bulk of the animation was created from individual stills that I shot of star shaped ice "cubes", then I used key frames in Premiere to make them all move. Finding the animated gold stars that appear in the glass of purple water at the end was the icing on the cake! Thanks Donnell and remember to also use the narrowest shutter angle possible too. 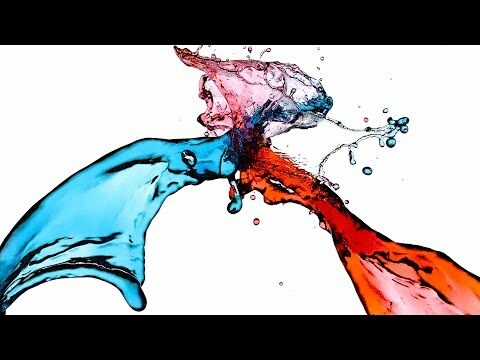 120fps with a 180 degree shutter will still yield a smeary image with fast moving subjects like splashing water.